Campsite 51 is on an awkward corner that will have headlights on the tent pad. Loop 3 does not allow generators. It is faster from almost every campsite loop to walk to the amphitheater for a ranger program/campfire program than to drive and try to find parking. There are 11 pay showers with a sink in spacious, individual rooms and a small laundromat (11 washers and 11 dryers, plus a tub to wash waders) in buildings near the campground entrance next to the campground office. In 2017 the Signal Mountain laundromat charged much more than the one at Colter Bay. 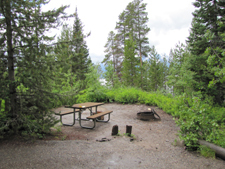 It is wise in all the campgrounds that along with placing your camping permit on your campsite post, that you leave a non-valuable item to show that your site is occupied. There is free WiFi available at the Colter Bay laundromat, the Moose Visitor Center and in the Jackson Lake Lodge parlor that anyone can use without a secret code. Headwaters Campground at Flagg Ranch, near the Yellowstone Park border, has 100 trailer sites and 75 tent sites. Gros Ventre Campground is the closest campground to the town of Jackson (9 miles +/- Northeast) with 300 individual campsites and 5 large group sites. They vary in size and can accommodate RVs up to 45ft. There are two loop areas that do not allow generators and one loop that only allows tents. Thirty-six sites have electricity. Ten are ADA compliant with the adjacent restroom being ADA compliant. How much water is in Jackson Lake (reservoir) right now? Will I be able to launch my boat at the Signal Mountain ramp or will I need to go somewhere else? Check out the boat ramp link below. 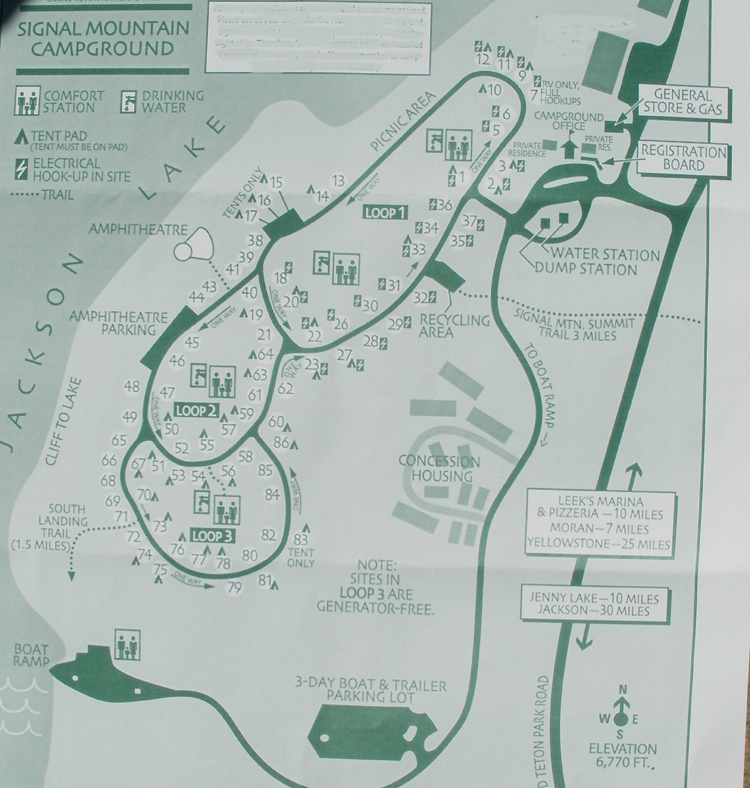 Full pool of Jackson Lake (reservoir) is 6769′. 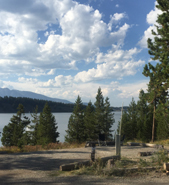 The end of the boat ramp at Colter Bay is at 6753′, at the end of the boat ramp at Signal Mountain Lodge is 6737′ and at Leek’s Marina it’s 6735′.